Collect (9/1-9/27): Throughout the month of September, collect food and funds to donate to the Food Bank of Lincoln. Click here for a list of our most-needed items. 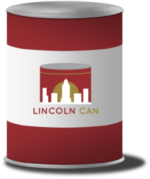 Donate (9/27): Bring all donations to Lincoln CAN at Gateway Mall on Friday, September 27, from 3:30-5:30 p.m.